Britain's hugely popular Soul Survivor event has down the years elevated quite a few worship leaders to national prominence. Amongst these is Watford-based Beth Croft who has been contributing regularly to the annual event and its sister Momentum. 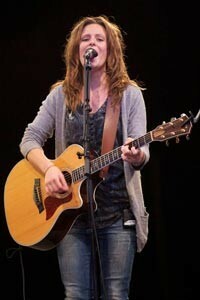 The Soul Survivor & Momentum album 'Live 2012: Kingdom Come' featured worship leader Beth, together with Sam Bailey, Tom Field and the Rend Collective Experiment. Beth, who works full time with Soul Survivor, spoke to Cross Rhythms. Here is what we said. Beth: I was born and bred in sunny Watford, which is where I'm sitting right now. I was brought up in a Christian family. I've always known God, but my journey with him evolved - especially during those crucial teenage years. We moved churches, as a family, to Soul Survivor, Watford when I was about 15, 16. That's where my faith came alive. I decided to start living every day for Jesus. I was in the youth band playing keyboards and singing. Around 2003 I started travelling - playing keys and singing backing vocals - with a team from Soul Survivor, just on the weekends. That was really where I got involved in worship. I didn't start leading worship until I was about 18: picked up the guitar, taught myself a few chords, and led worship at my cell group, because there was no one else to do it. I was very nervous: didn't want to do it, but felt God wanting me to step up and go for it. Tony: I understand that it was almost by accident that you led worship at Momentum. Beth: I was at university - just about to start a worship internship with Tim Hughes and the Worship Central team. I'd never led a church service and, honestly, I didn't know what I was doing at all. But one of our female worship leaders called Andreana Arganda was off sick. I can't remember what she had now; I think it was some horrible chest infection. It was around that point we'd started to be really vocal about the fact that we were passionate about women in leadership: we wanted to encourage women. This was one of the first Momentum festivals in its own right. Because Andreana was in bed, we didn't have a female worship leader - and we saw it as so important to practice what we preach. I remember Mike Pilavachi asking me the day before, explaining the situation. I had the worst night's sleep I've ever had. I co-led with Ben Cantelon, who was very patient and gracious. It's funny how it all happened. After that summer, I went on to Worship Central and that's where I grew in my worship leading. I went from leading worship in my bedroom to leading worship three or four times a week at prayer meetings or church or whatever. It's one of those situations where you're forced to swim, which was so good for me." Tony: I think it was 2007 that you began writing your own songs. How did that start? Beth: Writing has never come easily to me: it's something I have to work at. For instance, I started the song "Arms Of Grace" in 2007 and only finished it in the summer of 2011. It was a chorus I'd had; I recorded it when it came into my head, then never found a verse that sat right. So much of songwriting is about discipline: once you've got the idea it's then the hard slog of crafting it into something sing-able. It seemed to fit and it seemed to say exactly what I wanted it to say. I guess there was a reason why it was taking so long, because I think God revealed more and more to me about what grace looks like. As of 2009 I started working for Soul Survivor full time: that became my day job. Songwriting is something I have to work hard at. I love singing other people's songs, the ones I connect with, as well as ones I've written myself. There are plenty of amazing songs out there I connect with on a deep, heart level." Tony: Who makes the selection of songs at Soul Survivor? Beth: We try and keep it as organic as possible, so a lot of it is songs we've been using throughout the year that we've seen connect with people. The more formal process of how that happens is we sit down a few months before the festivals - the worship leaders, with Mike as well - and chat about which songs we feel would be appropriate for the festivals. They're definitely two separate things now, Soul Survivor and Momentum. It's an organic thing, but it's also an intentional thing, trying to find songs that will connect with people. Tony: Would you say the Soul Survivor event is still changing? Beth: "We're always looking to do things better and serve the young people better and better. From that point of view, yeah, I think it is changing. We never want to settle the way we're doing things: we constantly want to be looking at, 'Is this the best way of serving the young people?' And constantly looking at things that pop up - different feedback we get, we really value that, and also feedback from our staff and how we think the running of the event has gone on a more administrative level. At the same time, there are some things that don't change that are to be celebrated. Every year we make space for people to come into a relationship with Jesus, and without fail God moves those people, brings them into a relationship with him; they respond and choose to give their life to him. Other stuff: God meeting with people and ministering to them on a deep level when we make space for his Holy Spirit to move. Those things never change: those are the values, the key things we are sold on. Making lots of space for worship - those kinds of things I don't think we'll ever change, because that's who we are. It's a mixture." Tony: How much are you in the moment, being led by the Spirit? Beth: "We're really lucky to have fantastic musicians we work with, which makes that easier. I'm not saying we wouldn't do it if we didn't, but it makes it so much easier. I know if I'm leading somewhere that we haven't pre-planned, that we haven't rehearsed, the band will follow completely. Even if they don't, to be honest, we want to be led by the Spirit anyway. That's part of who we are and what we want to model in the way that we lead worship. In the moment, we do prepare set-lists, but those are usually done a few hours before. We're constantly trying to think, 'How are people engaging with this song? What's going down well? What do we think the Lord is doing?' And also in the context of what's happened during that week. We do have a set-list, but we're always trying to be on the ball with what God's doing. Often I'll drop a song, replace it with a song we haven't rehearsed. Usually it'll be a song we know, that just isn't on the list, but sometimes it'll be an unwritten song." The interview really blessed me because I got to see somethings that had troubled me do the same to someonelse;Beth Croft,so i believe God that made you and is still making you overcome those challenges revealed during the course of the interview,would help me overcome mine and make me better in Jesus name. Great interview, we bless God for Beth and the gift she is. I came across her singing once in SS conference i was watching on Telly... Years ago. Will be getting more of the music wow! So amazing, i love what she shared on song writing. Keyword = patience. 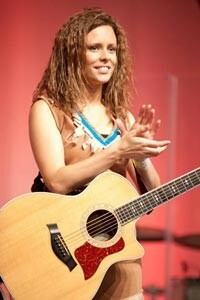 I love Beth's cd @Rule in my heart@ . It is such an inspiration. I love the words of the songs - they are an amazing led in to worship. Just wonderful. Thank you Beth. Beth, praise the Lord for your amazing talent! You have such a gift and your songs are all awesome. I love your songs in the latest SS album. So inspiring! God bless you Beth!